and subsequently extreme winter condition? Cold winter spells in the U.S.A. and Canada are very common. This year was no exception. Before looking back to winter 1939/40, the first war winter in World War II, a brief review of the last winter in North America. That was not a natural occurrence. In autumn, there was war in East Asia, and in Europe. Globally the northern Hemisphere was affected. At first, it rained more than in average. With less moisture in the air, subsequently came the cold. In Europe, it was the coldest for one century. In the South-East of the United States the coldest ever observed. The extraordinary conditions almost eight decades, should not be forgotten, but serve as reminder that events than were anthropogenic influenced. Even the smallest percentage contributed by human activities to the weather pattern in winter 1939/40 needs to be understood and discussed in the general debate on climate change. To serve this purpose, it follows an excerpt from the Book: “Failure of Meteorology”. NOTE: Text and Figures are not necessarily identical, but shortened, altered or changed. Did the war show an effect in the U.S. in autumn 1939 and January 1940? The fact that the first signs of a real winter emerged at Christmas time 1939 (NYT, Dec. 23, 1939) was presumably not worth a doctor’s thesis at any time. Neither that the winter earnestly came in early January 1940, with a frigid wave that gripped most of the United States (NYT, Jan. 6, 1940). Icy north-westerly winds swept over New York with force, on January 6, causing temperatures to drop to an average of 10 degrees Fahrenheit below normal. Frigid waves even touched northern parts of Florida (NYT, Jan. 07, 1940). But the information by Dr. James Kimball, published in ‘The New York Times’ on January 7th, 1940, that November 1939 had been unusually dry, should have been investigated by science, or in a doctoral thesis, why that had happened, and whether military activities in China and Europe, and the increase of condensation nuclei had anything to do with it. The less humidity there is in the atmosphere, the more easily it can be replaced by colder air. If the amount of water in the atmosphere is less than average, the ‘vacuum’ thus created, needs to be filled by air. The fact that the Northern Hemisphere was in such a state towards the end of the year 1939 is very likely and science could have found out why long ago. The USA had been recorded as very dry in November and early December, which made it easy for Arctic air to travel south to filling up the gap. But it all started two months earlier. In September 1939 the sun state had to cope with a number of weather caprioles. The unanswered question until today is what role an El Niño event had in that place at that time, and the contribution of war activities in China and Europe, due to the excessive release of condensation nuclei. Much too extraordinary and seldom was the situation that caused high precipitation during September with 370% above normal in California (Alabama, 119%; Arizona, 335%; Nevada 327%; Utah 261%). California experienced an eight-day-long heat wave since about September 16th before a tropical storm, formerly a hurricane, hit Southern California, at San Pedro early on the 25th with winds of severe gale force. The up to 11 Beaufortstrong winds were the only tropical storm to make landfall in California in the twentieth century. The air pressure went down to 971 mb, and the excessive rain caused heavy flooding, e.g. September records in Los Angeles (5.24 inches in 24 hours) and at Mount Wilson, 295mm/11.60inches). It was the heaviest September rain in Los Angeles’ weather history and it broke the worst heat wave in Weather Bureau records, as measured by intensity and duration. (NYT, Sept.26,1939). The scientific disinterest in investigating whether the exceptional conditions had been a reflex action in the atmosphere that reached North America from the French-German, or the Polish-German front in Europe, e.g. from thousands of planes in the air, from shelling and burning down Polish villages and Warsaw, or even from fighting in China is stunning. That El Niño had a stake in the issue will be hard to prove, as the air temperatures at the equatorial Pacific was neutral, if not in La Niña condition (see: Fig. below), and global temperature maps for Sept./Oct./Nov.1939, HERE). Further details: Chapter F (here: http://www.seaclimate.com/f/f.html ). Except for a few States in the east (see above), the fall season was extremely dry over large areas. For all the areas east of the Rocky Mountains it was the driest fall on record (Martin, 1939). For about 9 States it is the all-time record, TM5, and the dryness must have severely affected southern Canada as well. Time magazine titled on December 25th, 1939: “WEATHER: Driest Fall”, and reported “the driest fall on record, a severe case of spotted drought affecting 97,000,000 U.S.acres.” About 16 States had less than 33% of their normal November precipitation. What else was curious in late 1939? The 1930s were famous for the ‘Dust Bowl’, during which severe dust storms caused agricultural damage to American and Canadian prairie lands. In some areas this phenomenon lasted until fall of 1939, when regular rainfall finally returned to the region. “Paradoxically, most of eastern Canada north of latitude 48° was above normal, with temperatures ranging up to more than 25°F above normal north of latitude 58° and 18°F above normal in the interior of Alaska. Missouri was actually as cold as the Hudson Bay region for the month”. Nowadays this constellation brings the question of an interrelation with El Niño conditions into play, which is done in Chapter F (here: http://www.seaclimate.com/f/f.html ). The Timing: The ‘timing’ between excessive rain in Europe and the dry months in the United States is a perfect indication of the relationship between both events. Any ‘interchange’ between dry and wet air takes its time. A dry or humid air body can exist from up to several days to a few weeks. An ‘air body’ needs a couple of weeks to circle the Northern Hemisphere. Scherhag (1951), analysed a disruption in the circulation of air in the winter of 1940, and states with regard to air movements that there must have been a subsequent air-body-transfer (“Massentransport”) from the Southern Hemisphere towards the Arctic, which means, that ‘dry air’ from Europe could have circled the globe for some time before a ‘humidity gap’ could be refilled. This also confirms that there was a ‘humidity gap’ in the first place. If the ‘dry-out’ had not been caused by military activities, what else could have caused it? Record Warmest vs. Record Coldest: The fact that temperatures in December 1939 (see TM5) had been widely above normal, versus the observation that in the south-east of the U.S. recorded values were much below normal with eight States experiencing the coldest January on record should be enough reason to ask why, and to consider whether it had something to do with war activities elsewhere. The Regions Covered: January 1940 was cold in all Northern Hemisphere regions, viz. North America, Northern Europe and Northern Asia. This is a strong indication that there was too little humidity in the air (as proven in the case of the USA – above), giving arctic air a free path to penetrate deep into southern regions. 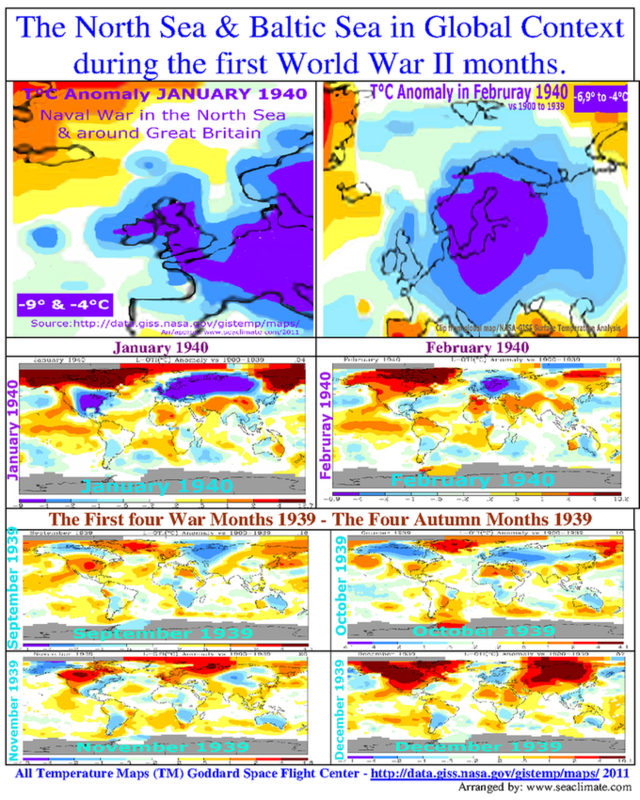 Difference between the winters in the USA and Europe: a further piece of evidence is the fact that the severity of the winter in the United States was over by the end of January 1940 (Brooks, 1940), whereas extreme winter conditions prevailing in Northern Europe during February 1940 show that a number of countries, e.g. Holland, Northern Germany and Southern Scandinavia, experienced their coldest winter for more than a 100 years. According to TM4 (page 45) the south-east USA and Europe were likewise again cold during March and April 1940. Lower air circulation: according to R. Scherhag (1951) the winter of 1939/40 was the result of a comprehensive general disruption of the atmospheric circulation, which could be regarded as a ‘prototype’ for a weakened circulation. Less humidity in the atmosphere and lower temperatures in seas and oceans, due to naval warfare in the waters of Northern Europe , inevitably caused disruptions in atmospheric air movements. Is it possible to establish a connection with the war? At this stage of the investigation, it is too early to give a definitive answer. Actually, this section only highlighted the aspect of rain and humidity, and gave a brief overview of the situation in the United States in autumn 1939 and January 1940. However, as long as there is not a more convincing explanation of what had caused the numerous observed deviations from the statistical mean in fall of 1939, the war in China and Europe is a serious option, and it is a more convincing work thesis rather than talking about meaningless “natural variations”. Anyway, timing is perfect, and far and wide, no other identifiable cause can be seen, at least not for the conditions in Europe . A number of indications show that the war in Europe and in China may have significantly influenced winter weather conditions over long distances. In this case, North America had a severely cold January in 1940. Most likely, it had been supported by a lack of usual rain in the United States during the months of October to December 1939, in the first place due to generating condensation nuclei by military activities in Asia, in Poland and along the Western Front in Europe. The obvious “rain forcing” in autumn 1939 that caused low humidity in the atmosphere, made it easy for arctic air to forcefully travel down to the mid-latitudes of the Northern Hemisphere. The timing of ‘dry air’ and the invasion of polar air over all NH continents suggest that this was not a mere natural variation. The drier the air properties at lower latitudes are, the easier arctic air can spread southwards. The lower maritime influence is (warm moist air), the more continental conditions will prevail (cold dry air). The Northern Hemisphere felt it with full force in January 1940. A severe winter, the coldest in one hundred years in countries bordering the most war-affected seas in Northern Europe, did not come ‘just out of the blue’, but it was a combination of too dry air circling the hemisphere and naval operations in the marine environment of Europe. C4. The sky cries because of the war?